Made a couple of polish purchases this weekend. 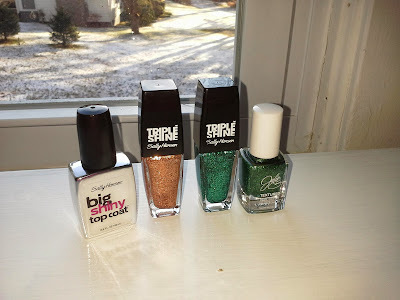 Picked up two sally hansen triple shines: dream sequins a copper glitter, and seanic a green glitter. Also picked up a new shiny topcoat. I found this in the new sh nail art display, and it was almost impossible to pass up on the nail pens, but I put them on my christmas wishlist and I'll wait to see what santa brings! The last purchase was julie g mistletoe, it's a christmas green texture polish.